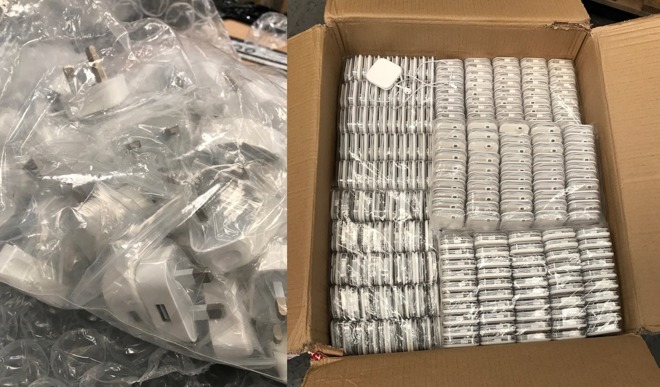 A collection of fake Apple products estimated to be worth £1.3 million ($1.69 million) were seized from a warehouse in London on Tuesday, with the raid by UK police and local Trading Standards officials confiscating a large collection of imitation Apple chargers, batteries, and other items. 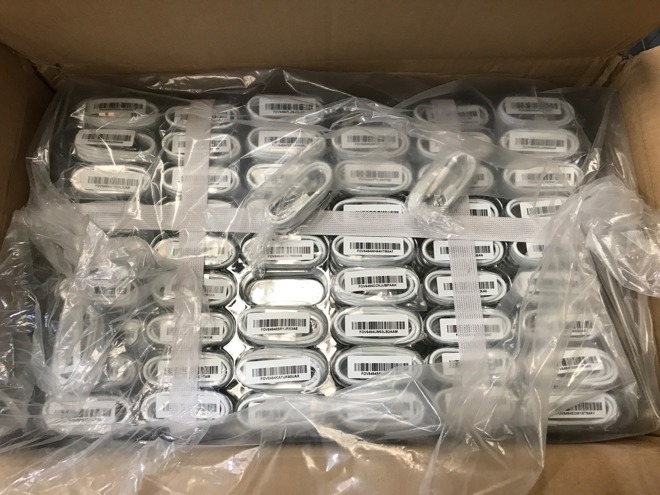 The raid followed a six-month investigation by West Sussex Trading Standards, after it received a complaint about an Apple-branded charger sold from an undisclosed store in Haywards Heath. The customer told Trading Standards they were alarmed by the way the charger, sold for £59 ($76.90), overheated when used to power their MacBook. Trading Standards followed up the query by carrying out a test purchase from the same store, with the charger later confirmed by Apple as both a fake and unsafe to use. Further investigation took officials to another store in Brighton, East Sussex, which led to a warehouse in Kingston-upon-Thames. An entry warrant for the warehouse was executed on August 1 by nine Trading Standards officers and members of the Metropolitan Police, with Apple investigators also in attendance to aid with searching the warehouse. The discovered fake goods, which included headphones, batteries, chargers, and assorted cables and adapters, is said to be the biggest seizure in West Sussex Trading Standards history. Officials claim the products were "instantly recognized" as fake due to their serial numbers. While all official Apple products have unique serial numbers for identification purposes, as do other manufacturers, investigators noted many of the items they seized shared the same serial number. West Sussex Trading Standards team manager Richard Sargeant advised the successful operation was important for two reasons. "Firstly, we need to protect consumers from purchasing potentially unsafe products and secondly recovering 1.3 million of fake goods helps protect those traders who sell genuine Apple products from being undermined in the marketplace." Accessories for iPhones, iPads, and MacBooks have become a lucrative targets for criminals producing fake goods due to the company's popularity, a problem that has forced Apple warn consumers about the counterfeit products on a regular basis. Apple's crackdown on the practice has previously included lawsuits against fake accessory vendors violating its copyrights and trademarks, alongside action by law enforcement officials.